Since I last posted about our spare bedroom, I have made a few modifications. After upgrading the guest bedroom to a queen-size bed, I was missing a headboard for this full-size mattress set. 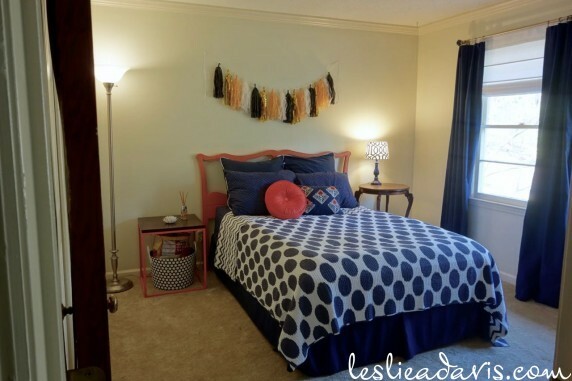 I found a cute wooden headboard at Goodwill last July that I painted Coral Isle by Krylon. 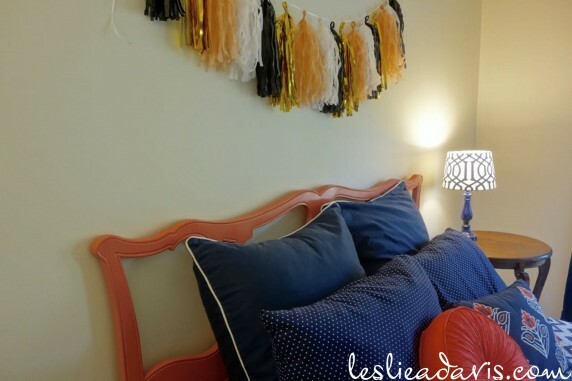 I also switched out the frame above the bed for a tissue tassel garland from 2Berry Creative. I also made a couple of changes to the window treatments. The PBK curtain panels had been left by the previous owner and I had put curtain rings on them so that I could hang one panel in the center of the two windows. Unfortunately that made the panels puddle a little on the floor, so I eventually broke out the drill and raised the curtain rod a little – as well as widening it, to open up the windows a little more. In December, I added roman shades to the window for a little more light control and privacy if we have someone stay in this room. 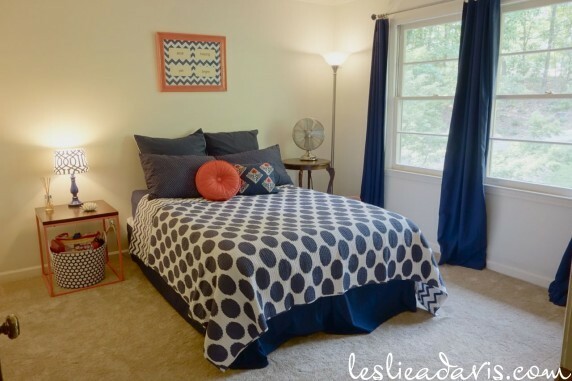 This entry was posted in Bedroom, Our Forever Home on March 21, 2016 by Leslie.